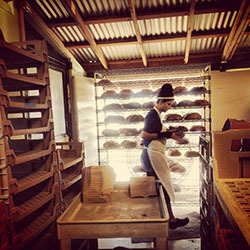 Join us for a Tour of Giusto's Central Milling in Petaluma followed by a tour of home and baking facilities of Ed and Kathleen Weber's Ranch and original Della Fattoria. We will be hosted to a delicious lunch by Della Fattoria. Sign on road says "Weber"
We will meet 10 a.m. sharp at Giusto's Central Milling in Petaluma.